What is Excel OFFSET Function? Excel OFFSET Function returns the Range object which is number of rows and columns away from a specific range. You can specify to shift up, down, left or right from a cell. For example, if column A contains employee ID, and column B contains employee name, you can find the employee name in B2 by shifting A2 to the right. (shift 1 column to the right and shift 0 row). The advantage of using OFFSET property is that even when the actual column change, you don’t need to hardcode “column B”, you just need to specify the column which is one column right from the employee ID column. 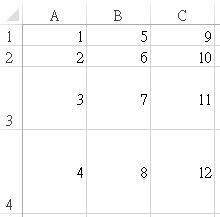 There is OFFSET “Property” for Excel VBA, but the parameters are slightly different (without height and width). Read the below article for OFFSET Property. reference is the specified range where the shift starts. Note that if the returned Range contain multiple Cells, you can only see the first value of returned Range if OFFSET is used in worksheet formula, as one Cell cannot display multiple values. You can also combine the use of finding last used Range with OFFSET function in order to return a Range from first row to last used row.